Autism is a complex neuro-developmental disorder causing deficits in social interaction and language development at an early age. The severity is based on the level of impaired social communication and restricted, repetitive behaviors. The average prevalence of autism in 2013 was reported to be 1%. However, there has been a 600% increase in the last two decades. Some of this increase can be attributed to a broadening of the definition of Autism since 1980, but the etiology of autism continues to be widely debated, raising questions as to whether the increased prevalence is a result of biological or environmental factors. This paper explores the etiology of autism in consideration of biological and environmental factors. The word "autism" is derived from the Greek word ‘autos,’ meaning ‘self’, and was first described by Leo Kanner when he observed withdrawn and uncommunicative behavior in children (Kanner, 1943). Autistic disorder (autism) is a neurodevelopmental disorder that leads to problems in social communication, language development, and which is also associated with restricted, repetitive behaviors (Strathearn, 2009). The prevalence of autism across the world was reported in 2013 to be 1% of the population (Center for Disease Control and Prevention [CDC], 2014); and yet, the etiology of Autism continues to be widely debated. This paper explores the etiology of autism while considering whether the prevalence of autistic disorder is influenced primarily by biological or environmental factors. The prevalence of autism in the United States (U.S.) was 1 in 110 children in 2009, having increased from 1 in 250 since 2001 (Figure 1). This increase has led some researchers to identify an ‘autism epidemic’ (Liu, King & Bearman, 2010). Scientists are not sure if the drastic increase is a result of an actual rise in the incidence of autism, an expansion of the definition, or simply a greater awareness of the disorder. Meanwhile, the cost of providing care for an individual with autism over the course of a lifespan is considerable: in the U.S., the number is estimated at $3.2 million (Ganz, 2007) and in the United Kingdom (U.K.) £1.5 million (Järbrink & Knapp, 2001). It was reported in 2011 that the total societal costs of taking care of children with ASD in the U.S. was over 9 billion dollars (Lavelle et al., 2014). For many reasons, it is important to understand the factors that influence the prevalence of autism. Better understanding of the disorder could help identify modifiable risk factors and lead to early screening, prevention, and hopefully a decrease in the prevalence of autism. The major scientific question related to this paper is based on the nature vs. nurture debate: whether autistic behavior is influenced by genetic factors or environmental conditions (Strathearn, 2009). In order to understand autistic disorder, the history of the Diagnostic and Statistical Manual of Mental Disorders criteria for the diagnosis of autism is reviewed. Both biological and environmental factors are considered from a theoretical perspective. The biological level of analysis maintains that there is a genetic basis to autistic disorder based on patterns of inheritance (Walsh & Hurley, 2013). Twin studies, familial inheritance, and gene mapping support the biological basis of autistic behavior. In contrast, the socio-cultural level of analysis asserts that the increased diagnosis of autism is a result of environmental factors such as social deprivation of infants in adoption studies, the change in diagnostic criteria, and the role of social awareness. The Diagnostic and Statistical Manual of Mental Disorders (DSM), published by the American Psychological Association, is the standard for the classification of mental disorders (Diagnostic and statistical manual of mental disorders: DSM-V-TR, 2013). Autism is diagnosed on the basis of abnormal behavior, and researchers have agreed on common symptoms and behaviors; this has led to a greater specification in the diagnostic criteria in the DSM (Happé & Frith, 1996). Autistic disorder is grouped under the label of Autism Spectrum Disorders (ASD). Signs of autism are usually evident during the first three years of life, and include temperamental extremes, lack of eye contact, and unusual responses to visual stimuli (Walsh & Hurley, 2013). In order to be diagnosed with autistic disorder, an individual needs to meet specific criteria that include persistent deficits in social communication and interaction, restricted or repetitive patterns of behavior, and the onset of symptoms in early childhood (see Figure 2). According to Abrahams & Geschwind (2008), autistic disorder is the most severe ASD and these individuals suffer from the most severe cognitive impairments. 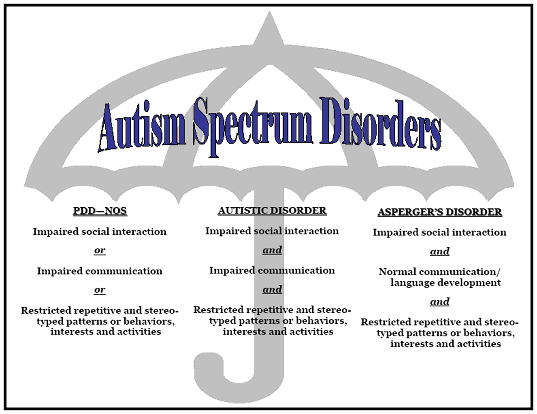 The two other types of ASD are Asperger’s syndrome and Pervasive Developmental Disorder (Figure 3). Asperger’s syndrome is a milder form of autism that can result in above average intelligence. Lastly, based on certain diagnostic criteria, children whose autism is more severe than Asperger’s syndrome, yet not as severe as autistic disorder are diagnosed with PDD-NOS (Abrahams & Geschwind, 2008). DSM-I: Children demonstrating autistic-like symptoms were classified as ‘childhood schizophrenic’ (APA, 1952). DSM-II: Children continued to be labeled as ‘childhood schizophrenic’ and criteria for diagnosis were “autistic, atypical, and withdrawn behavior” (APA, 1968). DSM-III: Autism was recognized as a distinct diagnostic category, with ‘infantile autism’ as the only form. A child had to have 6 signs and symptoms to be diagnosed with autism (APA, 1980). DSM-IIIR: Autistic disorder was described according to sixteen listed symptoms with an individual needing to present at least eight to be diagnosed with autism (APA, 1987). DSM-IV: Several sub-types of Autism were created and a category of pervasive developmental disorders was added. Sixteen symptoms were listed and an individual needed to have six to be diagnosed with autism. Two of the six symptoms need to be based on “qualitative impairment in social interaction,” one based on restricted and repetitive behavior, and one of qualitative impairment in communication (APA, 1994). DSM-IV-TR: Pervasive Developmental Disorder (PDD) was created as a diagnostic umbrella to include Autistic Disorder, Asperger's Disorder, Rett Syndrome, Childhood Disintegrative Disorder and PDD-NOS. An individual would need to demonstrate 2 markers of impairment of social interaction, as well as impairments in communication as well as repetitive and stereotyped behaviors (APA, 2000). DSM-V: Autism Spectrum Disorder was created to represent 3 separate disorders (autistic disorder, Asperger's Syndrome, PDD-NOS). To be diagnosed with autistic disorder an individual must have impairment of social interaction and communication, as well as signs of restricted repetitive behaviors (APA, 2013). Abrahams, B., & Geschwind, D. (2008). Advances in autism genetics: on the threshold of a new neurobiology. Nature Reviews Genetics, 9(5), 341--355. Diagnostic and statistical manual of mental disorders: DSM-V-TR. (2013) (5th ed., Washington, DC, U.S.A. http://dsm.psychiatryonline.org/content.aspx?bookid=556§ionid=41101757#103436574). Folstein, S., & Rutter, M. (1988). Autism: Familial aggregation and genetic implications. Journal Of Autism And Developmental Disorders, 18(1), 3--30. Ganz, M. (2007). The lifetime distribution of the incremental societal costs of autism. Archives Of Pediatrics & Adolescent Medicine, 161(4), 343--349. Happé, F., & Frith, U. (1996). The neuropsychology of autism. Brain, 119(4), 1377--1400. Järbrink, K., & Knapp, M. (2001). The economic impact of autism in Britain. Autism, 5(1), 7--22. Kanner, L. (1943). Autistic disturbances of affective contact. Nervous Child, 2(3), 217--250. Kaufmann, W. (2012). 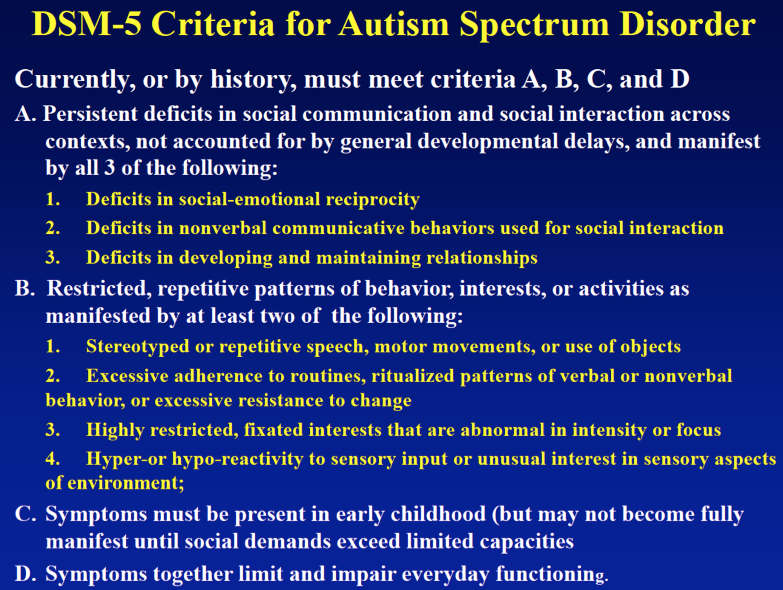 DSM-5: The New Diagnostic Criteria for Autism Spectrum Disorders. Presentation, the 2012 Research Symposium - Autism Consortium, Boston, MA, October 24, 2012. King, M., & Bearman, P. (2009). 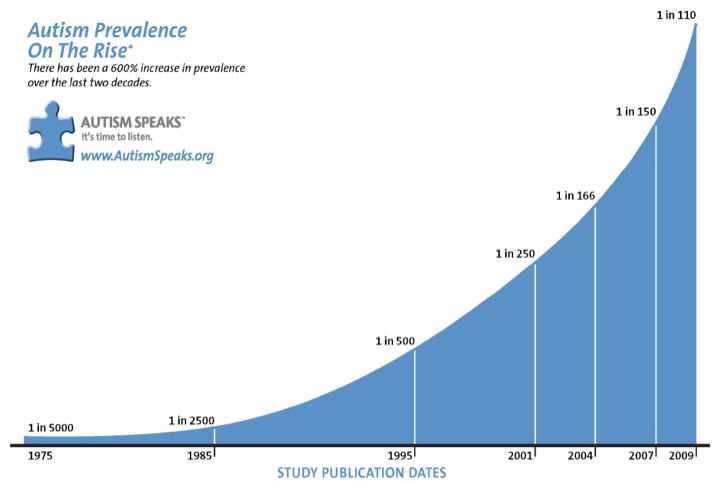 Diagnostic change and the increased prevalence of autism. International Journal Of Epidemiology, 38(5), 1224--1234. Landrigan, P. (2010). What causes autism? Exploring the environmental contribution. Current Opinion In Pediatrics, 22(2), 219--225. Lathe, R. (2006). Autism, brain, and environment (1st ed.). London: Jessica Kingsley. Lavelle, T., Weinstein, M., Newhouse, J., Munir, K., Kuhlthau, K., & Prosser, L. (2014). Economic burden of childhood autism spectrum disorders. Pediatrics, 133(3), 520--529. Liu, K., King, M., & Bearman, P. (2010). Social influence and the autism epidemic. AJS; American Journal Of Sociology, 115(5), 1387. Rosenberg, R., Law, J., Yenokyan, G., McGready, J., Kaufmann, W., & Law, P. (2009). Characteristics and concordance of autism spectrum disorders among 277 twin pairs. Archives Of Pediatrics & Adolescent Medicine, 163(10), 907--914. Rutter, M., Kreppner, J., Croft, C., Murin, M., Colvert, E., & Beckett, C. et al. (2007). Early adolescent outcomes of institutionally deprived and non-deprived adoptees. III. Quasi-autism. Journal Of Child Psychology And Psychiatry, 48(12), 1200--1207. Spitz, R. (1945). Hospitalism: An Inquiry Into the Genesis of Psychiatric Conditions in Early Childhood. Psychoanalytic Study Of The Child, 1, 53-74. Strathearn, L. (2009). The elusive etiology of autism: nature and nurture?. Frontiers In Behavioral Neuroscience, 3. Walsh, N., & Hurley, E. (n.d.). The good and the bad science of autism (1st ed., pp. 28-37). Wang, K., Zhang, H., Ma, D., Bucan, M., Glessner, J., & Abrahams, B. et al. (2009). Common genetic variants on 5p14. 1 associate with autism spectrum disorders. Nature, 459(7246), 528--533. Amrita N. Singh wrote this article as a student at St Peters Lutheran College in Brisbane, Australia.